Ren’s finally a hero. But he misses Trian, even with new friends to adventure with—even when the quest he’s on could cost him his life. 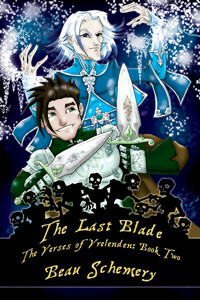 The Last Blade by Beau Schemery, a Harmony Ink Press Young Adult title available from Dreamspinner Press. David has traded life on Earth for superpowers and the Expanse. Now he and his boyfriend must battle the evil behind the God Hunters war. The God Hunters: Reunion by Mark Reed, available from Dreamspinner Press. Months ago, David Ruger was an average human with a flighty boyfriend. Now he lives in an alien universe called the Expanse and wields supernatural powers. He’s also traded in his flighty ex for Doug Colt, a man with a heart of gold and nerves of steel—which is a good thing, because his occupation can get rough. When David joins Doug and his brother, Bryan, on a job to track down a group of vengeful trolls, the journey takes them across the Expanse to the Shards of Exeter, a magical place made of continent-size landmasses shrouded in atmosphere. There, supernatural beings abound and formidable adversaries lurk in the shadows. But the mission is more than it seems. Through visions, David learns of the role he must play in reshaping the Expanse—and of the unspeakable evil that caused the God Hunters’ war so long ago. With that same threat resurfacing, David must embrace his destiny to save the family he has come to love. Feeding from pack beta Liam leaves vampire Cormac consumed with bloodlust. Meanwhile, Simon and Gray hunt a being that shouldn’t exist. Soul Magic by Poppy Dennison, available from Dreamspinner Press. Guest violinist Alex is not conductor David’s type—too many tattoos. But Alex’s music speaks to him, and David has been alone so long…. Prelude by Shira Anthony & Venona Keyes, available from Dreamspinner Press. Librarian Isaac meets lust demon Scratch in a club. Together, they flirt with damnation and escape slave traders to open the Horn Gate. Horn Gate by Damon Suede, available from Dreamspinner Press. If Brett wants to save Cory, he’ll have to see through Cory’s deception in time. Unfinished Business by Mia Kerick, available from Dreamspinner Press. King Garith must strike a balance between supporting his friends and assuaging the nobles who want Duncan punished—and Sasha executed. Ice and Embers by Augusta Li, available from Dreamspinner Press. Despite their disparate natures, Yarrow, Duncan, and Sasha united against overwhelming odds to save Prince Garith’s life. Now Garith is king and the three friends may be facing their undoing. Distraught over Yarrow’s departure to find the cure to his magical affliction, Duncan struggles with his new role as Bairn of Windwake, a realm left bankrupt by his predecessor. Many of Duncan’s vassals conspire against him, and Sasha’s unorthodox solutions to Duncan’s problem have earned them the contempt of Garith’s nobles. As Brute gets to know Gray, he discovers his own worth, but he also learns doing what is right can bring its own danger. Brute by Kim Fielding, available from Dreamspinner Press.